Henry S. appears for the first time on a census in 1901 living at 8, Queen Street, Flint, Flintshire with his family. His father was Paul Latham 33, a Labourer at the Black Works who had been born in Queensferry, Flintshire. He was married to Mary J, Latham, 34 who had been born in Dublin, Ireland. Their listed children were Anna 13 who had been born in Dublin and Henry S. 5 who had been born in Queensferry, Flintshire. The 1911 census records Mary Jane still living at 8, Queen Street, Flint The only other member of the family, recorded was her daughter Annie Latham who was 23, single and a Silk Weaver in the Holywell Silk Works. There were 3 Boarders living in the household. According to the census form which was completed by Mary Jane, her marriage of 21 years had resulted only in the one child – Annie. Henry Stephen was not mentioned at all. Henry Stephen was 15 years old in 1911 and the census records a Stephen Lathem living as a boarder at Woodfield Villas in Queensferry. There was an Elias Lathem also boarding there. The two of them were ‘Underhead picklers’ in the Sheet works. The household was headed by Mary Catherine Griffiths and included 2 of her sons and a daughter. UK, Soldiers Died in the Great War, 1914-1919 accessible on www.ancestry.co.uk confirms his regimental information and tell us that he was born and resided in Queensferry and enlisted in Hawarden. His medal card also on ancestry details his medal entitlement and adds that his first theatre of war was ‘The Balkans’ (Gallipoli) which he entered on the 8th August 1915 and that he was killed in action 13 days later. There is an Flintshire WW1 Index Card (Queensferry F 13) for Henry Stephen Latham in the Flintshire Roll of Honour at The County Record Office in Hawarden. Unfortunately it conflicts with much of the information above. It says he was killed in July 1915 and written on the reverse:- “Address of the sister nearest Relative who would be glad of the address in memory of her brother, Miss E Latham, 45 Belgrave Terrace, Queensferry.” The only sister found in this search was Anna Latham. Any help untangling these mysteries would be appreciated. Stephen Latham is mentioned on the Queensferry School Plaque in the Queensferry War Memorial Institute, as one of the “fallen”, but is also mentioned on the Queensferry Roll of Honour that gives the names of the pupils who enlisted, however even some of these men died as well..
Henry Stephen is also remembered on the Sandycroft War Memorial in St. Francis’s Church. 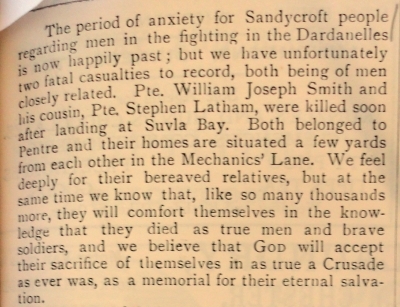 The period of anxiety for Sandycroft people regarding men in the fighting in the Dardanelles is now happily past; but we have unfortunately two fatal casualties to record, both being men closely related. Pte. William Joseph SMITH and his cousin Pte. Stephen Latham, were killed soon after landing at Sulva Bay. Both belonged to Pentre and their homes are situated a few yards from each other in the Mechanics’ Lane. We feel deeply for their bereaved relatives, but at the same time we know that, like so many thousands more, they will comfort themselves in the knowledge that they died as true men and brave soldiers, and we believe that God will accept their sacrifice of themselves in as true a Crusade as ever was, as a memorial for their eternal salvation.